I'm embarrassed to say that in the years I've lived in Brooklyn I've never been to Sahadi's. I've tried to go. Believe me, I've tried. But somehow I always manage to get there too late. Last weekend I arrived as they were closing but I was not denied. With just 10 minutes to shop, the whole experience was rather overwhelming--there's just so much that I wanted to look at! 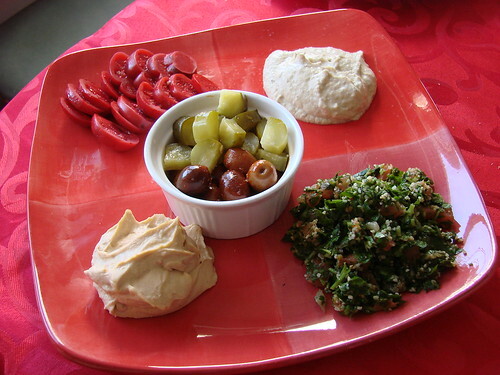 I picked up some ready made tabbouleh ($5.25 per lb), spicy Tunisian style black and green olives ($3.75 per lb), ready made baba ghanoush ($4.95 per lb), red pickled eggplant ($3.50 per lb), and a container of labne ($2.60). Just a couple of doors down at Damascus Bakery I picked up some handmade pita ($1.25), spicy hummus ($6 per lb) and yes, a container of Bulgarian feta cheese ($6 for 400g). So great. I've heard that Sahadi's can be a zoo on Saturdays during the day, but I'll definitely return. There's too much tasty food to explore. If your eggplant has a tough or damaged skin, peel it then slice into 1/2 rounds. In a small bowl add crushed garlic to olive oil. Brush one side of the eggplant rounds with olive oil and place on an aluminum foil covered baking sheet, oiled side down. Then brush the tops with olive oil. Broil for approximately 5 minutes per side until they are tender and slightly crispy. Remove from oven and set aside. Warm pita in the oven. Remove from the oven and spread with labne. Top with roasted eggplant and roasted pepper. 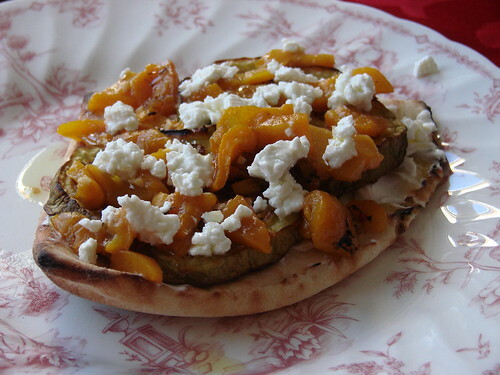 Sprinkle feta on top then drizzle with olive oil to finish. Delicious. Serves about 4. 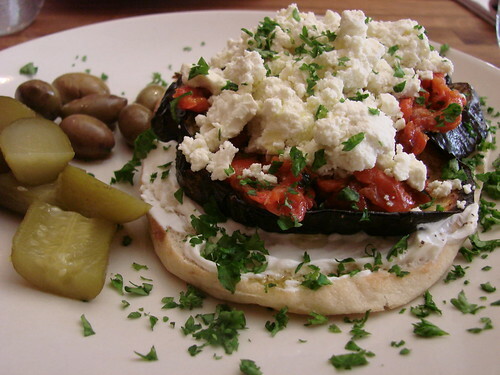 The pitas at Mimi's were bigger and fluffier than mine and the eggplant slices were bigger as well. When you factor in the shopping, cooking and cleaning time, Mimi's might be the winner--what can I say, I'm a sucker for having people cook for me? But, if you want a nice Israeli brunch at home this definitely fits the bill. And if you are feeding a crowd, it's definitely cheaper. Yum! That looks absolutely delicious. Props to you for trying your hand at an at-home version, but I agree that sometimes I'd rather save the time and effort. I love Damascus' hummus, but I can't wait to try out Mimi's if it's gotten your stamp of approval! @Gar: I got I guess the more "premium" handrolled pitas--they look like little triangles. @melissa z: Mimi's is great. If you're making the at home version for two it is a bunch of work--that said, once you have the ingredients you can easily to a repeat. I think it would be a fairly easy and not terribly expensive brunch to throw for a crowd. Let me know what you think of Mimi's when you get a chance to try it!